We knew snow was in the forecast for Friday evening, but we were only in the ‘coating- 1 inch’ region, and it was supposed to be all over by 11:30 Friday night. The race was scheduled for Saturday at 10:30, so no biggie we figured. Well, I guess the meteorologists dropped the ball on that one. When I woke up around 7:30, it was STILL SNOWING and we already had a couple inches on the ground. We got ready to run anyway, assuming it would stop soon. 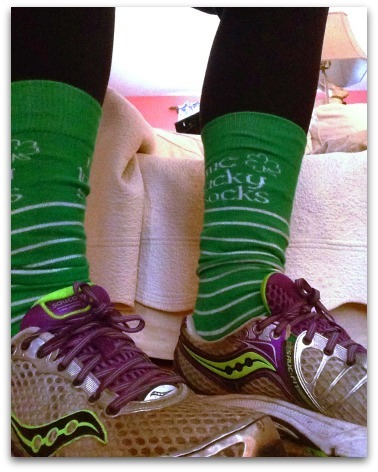 I even put on me lucky socks to go along with the St. Patty’s theme. 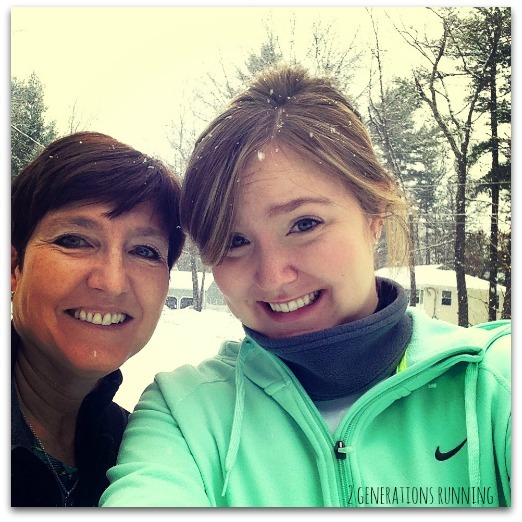 Before hitting the road, we took a quick snow selfie. We’re smiling for the sake of the picture, but trust me, we are not amused by this first-day-of-spring weather. I tried to take some more cute pictures of Brady on the walk, but his modeling technique leaves a little to be desired. 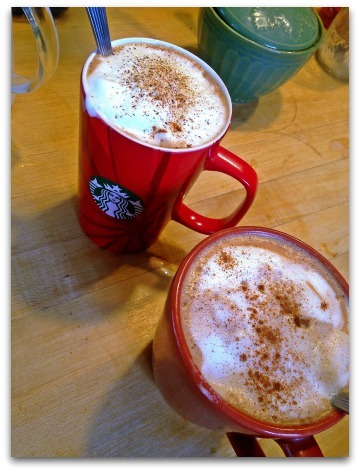 When we came back from the walk, my mom and I decided to make our own special hot chocolate since we were missing out on the hot cocoa bar (with Bailey’s) that the post-race party was supposed to feature. We didn’t have Bailey’s, so we used a little orange triple sec, and that worked quite well, I have to say. Sunday morning, the weather was finally clear and perfect for running. I knew I wanted to get in a nice, challenging run since I hadn’t been able to race yesterday. I decided to try my hand at a 5-mile progression run. I didn’t really know how it would go since my speed work went AWOL when my knee started acting up. My plan was to do the first mile around 9:00-9:15, and then try to get faster by 10 seconds for each following mile. I probably should’ve done the first mile a little slower, because I was really feeling it by that last mile. And Mile 2 was also a little fast, so I definitely need to keep working on regulating my pace. Mile 5 was mostly uphill though, so I’m not too upset about the slower split. I haven’t pushed myself to run outside my comfort zone in quite a while though, so I’m really happy with how this run went! I hope I have some energy left in my legs today, because I’m planning on a barre workout! Hope you had a great weekend! Were anyone else’s plans disrupted by the Spring snow? This entry was posted in Life and tagged 2 Generations Running, Brady & Keeper, Nutty Irish 5K, Progression Run. Bookmark the permalink. Sorry snow got in the way of your race. I didn’t have any races this weekend but couldn’t get a run in with all the rain we had. I love the pic of your dog. What kind is it? 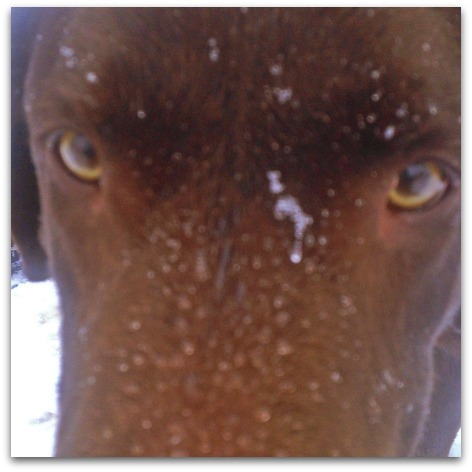 I have a chocolate lab. Hope your next race is filled with wonderful weather! 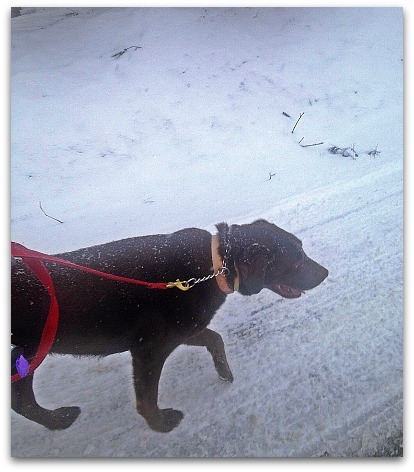 Brady’s a chocolate lab too!! Such a great breed 🙂 And thanks, I hope so too! More disrupted because of my shoulder, but that weather did NOT help! I definitely would have moved my long run to Sunday because of it because there was still snow everywhere Saturday morning. You had such a great run! And I love the up close and personal pic with your pup. What a cutie!